Dr Christopher Price has joined Bermuda Hospital Board’s [BHB] oncology team as a consultant medical oncologist, bringing to three the number of fulltime oncologists on staff. Dr Price comes to BHB from Worcestershire Royal Hospital in the UK. He achieved his Bachelor of Science in Medical Science with Pharmacology and MBBS [Medicine] from University of London [Kings College]. He subsequently completed training in medical oncology in London at St Bartholomew’s Hospital, and the University Hospitals of Nottingham and Southampton, UK. In 1993 he was awarded his MD for his research thesis into molecular techniques to monitor response to treatment in lymphoma. Dr Price was appointed consultant medical oncologist at University Hospitals Bristol, UK, in 1995 and remained there for almost 20 years. For 10 years [2003 to 2013] he served as director of Medical Oncology Training for the UK South West Region. He was active in clinical research in addition to providing clinical service in the busy hospital. In 2014, he moved to Worcestershire Royal Hospital to help develop and run a new oncology department. Prior to this cancer treatment facility opening in the rural county of Worcestershire in England’s West Midlands, patients in the 560,000-strong Worcestershire population had to travel outside the county to receive the majority of their cancer treatments. 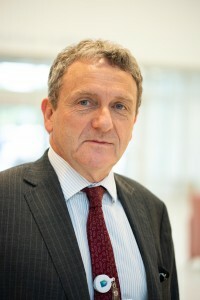 Dr Price also served as director of Research & Development at Worcestershire Acute Hospitals from 2014 to 2018 and clinical service lead for Oncology from 2017 to 2018. “I visited King Edward VII Memorial Hospital [KEMH] in November last year and was very impressed, not just by the outstanding beauty of the island but the obvious pride of all the staff in the excellent local health services that they are able to provide here despite the island’s geographic constraints,” said Dr Price. “The ambition of BHB and the KEMH Oncology Department to offer high-quality cancer care to local residents on the island wherever possible, in partnership with local charities and where appropriate with external institutions in North America, was very clear and I was delighted to be given the opportunity to contribute,” he added. “We are delighted to have been successful in attracting an oncologist with Dr Price’s expertise to Bermuda,” said BHB Chief of Staff Dr Michael Richmond. Dr Price will be joined in Bermuda by his wife, Sheldon [Shelley], and his two cocker spaniels, Florrie and Jessie, in October. He anticipates that his four children, the youngest of whom starts university in October, will be frequent visitors to the island.